QWhat is the current status of the Hambantota deal and what benefits are expected by handing the majority of shares to the Chinese? The initial agreement we had from the Secretary’s committee was not a document we saw nor agreed to. After that we started changing that. 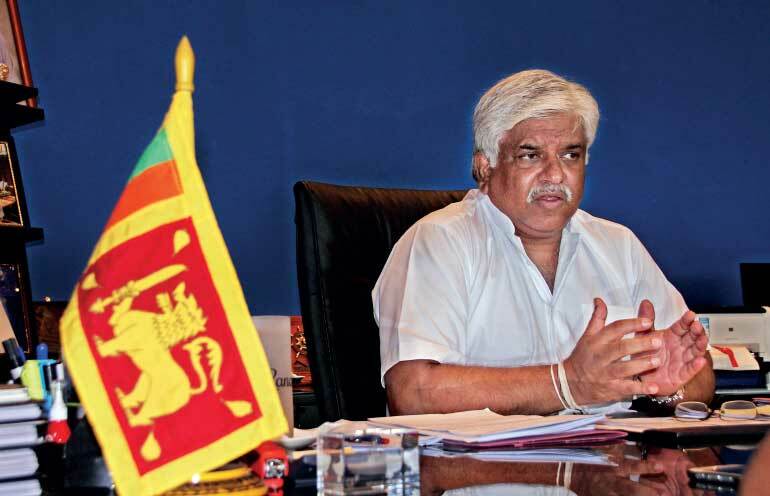 Then after the cabinet appointed a ministerial committee, we gave in our opinions, spoke about the Sri Lanka Ports Authority (SLPA) Act and the law of the country. By doing that, we have achieved approximately 60-65% of what we wanted by including our requirements in to the present document and also removing several clauses out of it. The national security is under the purview of the government and the SL Navy will get involved with the SLPA security. The biggest achievement was that after 199 years, we were supposed to buy back. But I don’t think even the Treasury would have funds to buy back because Hambantota might end up as one of the best Ports in the world. But now we could ask them to hand over and this is a huge achievement for us. Instead of this time period, the President insists that it should be 50 years. My other concern was that there need not be a private ports authority. Most of these have been agreed to by the committee but I am waiting till I get the final document, so that I would be able to present it to Parliament and ultimately the cabinet would take a decision. Q The Hambantota Port was making crippling losses and it was mentioned that 80% of its stake would be transferred to the Chinese company. But why was this percentage reduced? They can run a terminal because they are investing money, however, the Port should be run by the SLPA. If we give this particular excuse for them to create another ports authority, then the SLPA would be in trouble and subsequently all ports would have their own authorities. This would be a threat to the SLPA and that is the biggest concern I have. Q What is the current status of the Hambantota Port? Would it step on to a progressive path? We have put some tenders out and for bunkering we received around 20 proposals, for the land and port industrial area, we have got another 20 proposals. But we had to halt because the PM discussed this with his Chinese counterpart or the President in order to get rid of the loan. The option given to us was to take equity but they would be insufficient to clear the loan. That was when this proposal came in and initially two companies have given in theirs. They should have given those two proposals to the SLPA because they were the ones who knew about the functions of the Port. Instead they handed them over to the Secretary’s committee which led to failure. Q The Chinese have started taking over local businesses and projects. Why can’t mega deals such as this be handed over to local investors? The fact is that it is a huge investment made by the Chinese costing up to USD 1.4 billion. I don’t think anybody would pool in so much money even for equity. But I personally feel that if we give an opportunity to Sri Lankans to be a part of this, I am sure there are many who would be willing to contribute. That is the reason why I say that we should concentrate on the Port services and give them the terminal. This system has been implemented at the Colombo Port during CBK’s and MR’s regimes. Protecting the Port will be the biggest achievement we would have. Q Earlier this month you mentioned that the SLPA has faced many issues due to privatisation. Why should it be done so? I always say that if an institution is running at a loss, getting an investor and salvaging it for 33 or 50 years, is not a bad option. But when organisations are running on profit, private investors need not be involved. If we have our own money, if we can manage and get the business, then it is something we need to take positively. It would in turn beneficial to the government and the people. Q So, is it still going to be privatised? I am allowing an investor to come in and run a terminal. After a certain period of time, I will allow him to hand it back. But the Port functions and Port services should be done by the SLPA. Q The JCT Oil Bank for instance has enhanced its profits by 114 % in 2016. Shouldn’t other local bodies too be encouraged to make profits so as to retain them within the country without having to sell them off? It is all up to the workforce in this institution. Workers and officials can work together and run it properly. It is all about how you manage the institution. When compared to 2015, the SLPA made Rs.11 billion profits and the Oil Bank made 114% profits. We cut down on unnecessary expenditure and we stopped people who were earning money through rackets and got it legalized. For example, take the Lorries and containers, the registration fee for these vehicles were Rs.350 but to get a registered licence you may have to give money under the table, but we stopped these kinds of malpractices. They can get it registered by paying a premium of Rs.15,000 - Rs.20,000. We are using old machinery but still improved our efficiency. The private terminal on the other hand has new cranes which could perform better. Q India is likely to sign the Trincomalee Port development deal. What are your views on this deal? So far no one has given it to India, but the Indian government is very keen on investing in Trincomalee. But we have selected a company in Singapore to prepare a feasibility report on Trincomalee Port. After that we would have a proper idea as to how we could run it. That would be the next step we will go through. Some European countries, and even Japan has shown an interest in Trincomalee and other Ports in the island, including the Colombo Port. Q In the case that India starts investing in it, won’t there be a risk as they are already eyeing the Northern and Eastern borders of the country? My major concern is the national security and that was the reason why I objected on some of the issues I saw at the Hambantota Port. The Chinese are running a terminal here, the govt has only two terminals and even the Eastern terminal is very important for us. I think that is where we have the best draft in this port. Bigger ships go to private terminals which cater with bigger drafts in the Port. So we are looking at how we can have a proper stake at the Eastern terminal, if we are to get an investor. This would be very beneficial to the state-owned institutions. But we have to run it as a professional, independent and private-based venture. This means that they should function with the mentality of a privately-owned organization. We spend about 50% of our income to look after the people here. Therefore new employees need to be recruited and we are planning to adopt a system to the new recruits to the SLPA. Q An eight-member ministerial committee was appointed to decide on LNG plants, refineries and cement plants. What is the purpose and how important are these projects in the current context? I personally feel that we are late to initiate these projects. We should have started LNG long time ago. The world is changing from coal to LNG but we are yet to make any progress. Therefore we need to focus on the present global technology, and in that case, we are still lagging behind. Q There is a speculation about a cabinet reshuffle and that the Ports ministry portfolio too would be changed. What are your comments on this? I have achieved a lot as the Minister of Ports and Shipping and am still fighting to protect the institutions. We have formed this government to do the right thing and I have done my part during the last two years. If they feel I am not good enough, I prefer to stay at home. I am not a person who has looked at portfolios, and if I see that they are not doing the right thing, I won’t find it comfortable with these people. Due to this reason, I was the first man to leave the MR regime when I was a deputy minister. It was quite difficult for us to bring in the two main parties together. There were two instances where we could have brought this country to a different level. That was soon after the Tsunami and the war. But we missed both these opportunities. This is the third and the last opportunity I see where the two major parties have joined hands keeping their political agendas away and focusing on developing the country instead. We can raise a voice even if the President or PM bring in a cabinet paper. That has never happened during the past 10 years. Q People blame the govt or in fact all the past regimes for not implementing solutions for key issues such as the garbage problem at hand. What is your take on this? My major worry is that people in this country lost their lives and politicians taking these matters to the stage and trying to capitalise them. That is the worst ever thing I can see in today’s political scenario. We had to take some of the blame that should have been vested upon the previous regime. But the major issue was created by the former rulers because it was they who started dumping garbage at Kolonnawa. They never had a proper plan and even if they say that there were so many proposals, why couldn’t they implement them during the past nine years? If Gotabhaya Rajapaksa couldn’t implement a proposal despite the fact that his brother was President, then there should have been something radically wrong. We must ensure that such a catastrophe will not take place in the future.